Superb dining awaits each guest as culinary delights are prepared daily by master chefs featuring menus combining the very best eastern and western cuisine. 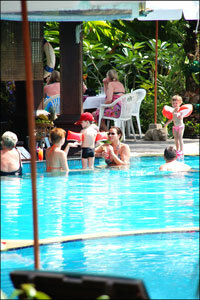 The Services of course, is friendly and efficient and the ambience befits the very nature paradise. 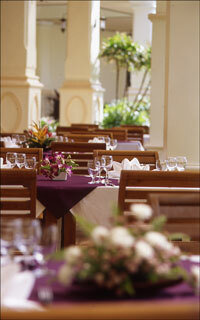 This open air with the high ceiling restaurant serves local Thai dishes and International favourites in the evening. Friendly services and our cuisine are waiting for you to experience. Open daily for Breakfast from 07.00 am - 10.00 am. 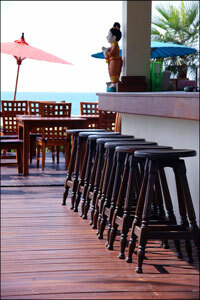 Verve 29 is located on the edge of the Khuk Khak Beach and has spectacularly stunning view of Andaman Sea. Friendly servers offer a fabulous range exotic drinks and all day a la carte menu. Located inside the Main Swimming Pool. The bar offers a great selection of refreshing drinks and tropical cocktail. Delicious fresh salads & soups, various types of sandwiches, pasta and pizza are also available. International and Thai selection are available to your room from 11.00 am - 10.00 pm.